The downtown historic Bethlehem area offers so many wonderful elements to bring out the very best in an engagement shoot. With really breathtaking Moravian architecture, holiday season cheer still glimmering here and there, and the sweet love of these two kissing doves, all that was left really was to frame and shoot! We all had an amazing time strolling around and enjoying all that this little town of Bethlehem has to offer. We hope you enjoy these few selections and the very best wishes to this adorable couple, Abigail and Andrew! We absolutely cannot wait for the wedding! We met with Bridget and Mike at Fonthill Castle on a nice autumn day. We decided to go a bit beyond the castle grounds and ventured into the forest to find the old farmhouse that stood on the property before Henry Mercer set the place as the grounds for his unique castle. Nestled in the woods the small house shows years of wear, tear, and some graffiti artistry, which might not please the groundkeepers, but sure make for some interesting photo opportunities. We loved working with Bridget and Mike and can’t wait for their wedding next year! 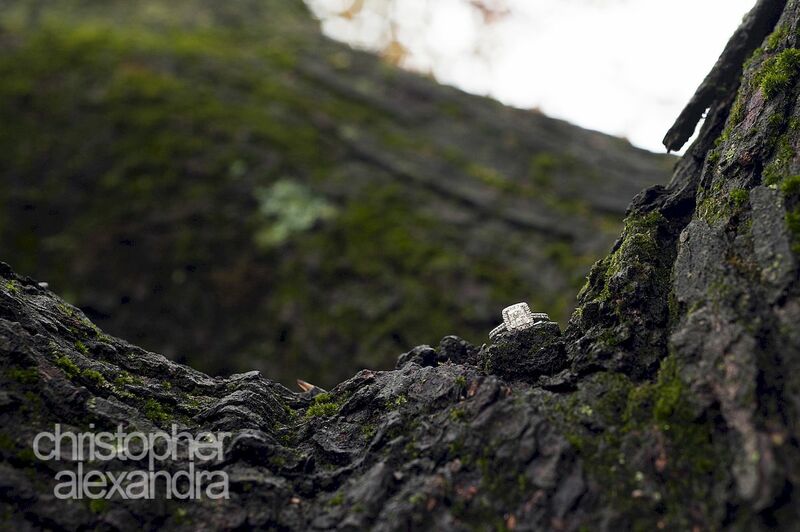 Carrie and James chose Fonthill Castle as their location for their engagement session. What a beautiful place! We explored the century-old property, taking the couple’s four-legged friend along the way. Loved working with this wonderful couple and cannot wait for their wedding day next year!